Todd conducts a safety briefing before starting work in Propsect Park. 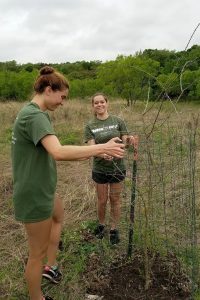 We partnered with Susan Hanson’s, “Nature and the Quest for Knowledge” honors class during Bobcat Build held this year on April 1st. 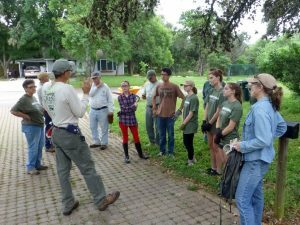 We tackled familiar projects such as reducing the amount of ligustrum in the 9 acre park, removing trash that had accumulated over the years and caring for the Bois d’Arc, Texas mulberry and Mexican plum trees in the meadow. The base of the trees were weeded, mulched and the trees themselves pruned for future growth. 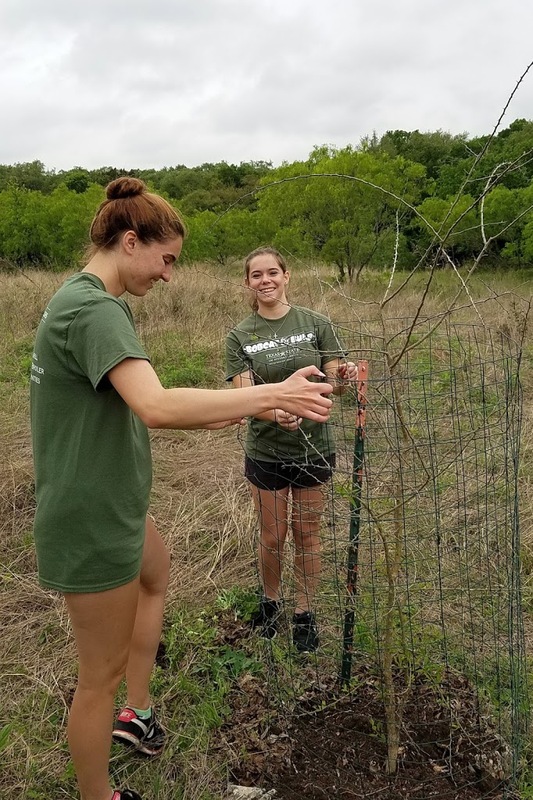 The ligustrum was cut and treated on Thursday prior with help from the Habitat Conservation Plan (HCP) crew that works to improve the water quality in the Edwards Aquifer. Prospect Park has many karst features that filter rainwater down the limestone openings to the aquifer. Trail crew and students used loppers to reduce the size of the branches and leave in place to slow water flow. Mountain laurel and shade-friendly grasses were seeded on the hillside beneath the cut ligustrum. More than two inches of rain fell the next day and should spur growth in the reworked areas. 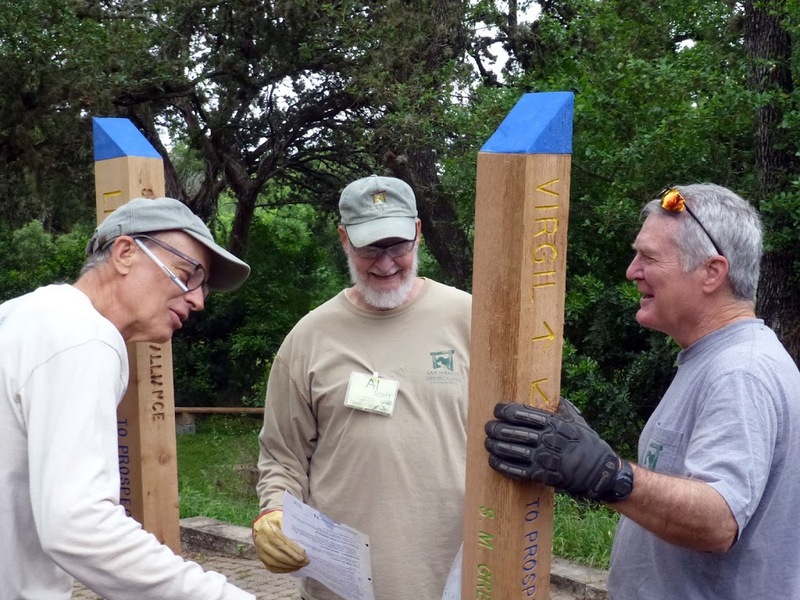 Todd, Al and Joel discuss proper placement of the markers. Two pickup truck loads of bike parts, box springs, and other metal parts were removed from the park as part of the morning’s work list. 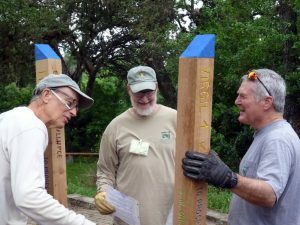 Additionally, two new trail markers were placed in the park. Because the ground does not yield to digging, rock cages were placed to hold the markers upright. 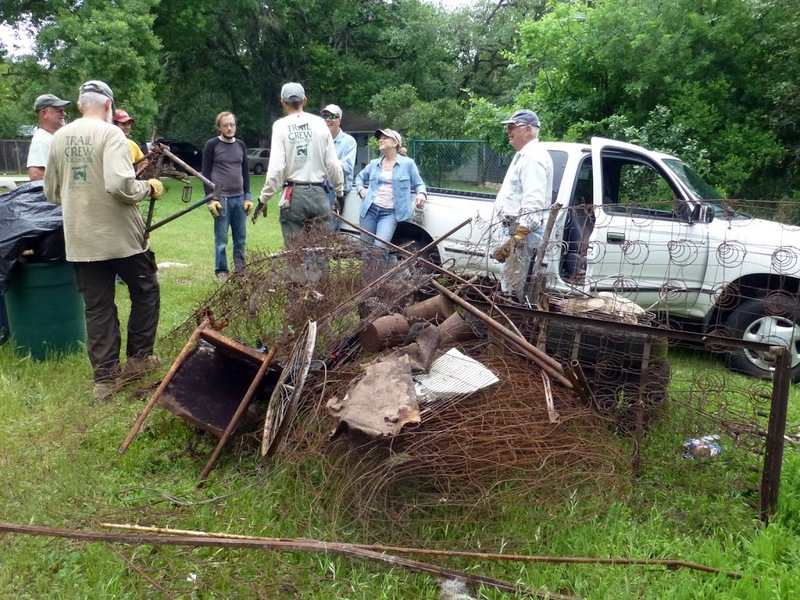 A fraction of the metal waste removed from Prospect Park by the trail crew.